Farnborough Airshow 2018 is sure to thrill all members of the family with new planes and attractions being announced almost daily. Highlights of this year include The Red Bull Air Race, Harrier and F16 jets, take on gravity, tank driving and lots more. 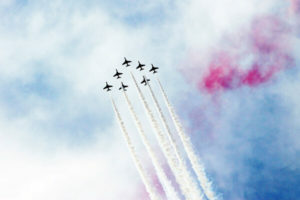 The airshow runs from 16th July to 22nd July. Monday to Thursday (16th-19th) are trade-only days, there is no public access on these days. You can of course still see the air displays during these days from outside the airfield. On Friday there are limited tickets available to the public whereas on Saturday and Sunday (21st & 22nd) the airshow opens completely to the public. The airshow opens at 9am and closes at 6pm. The aerial displays take place between 13.30-17.00 on Friday and 12.30-17.30 at the weekend. 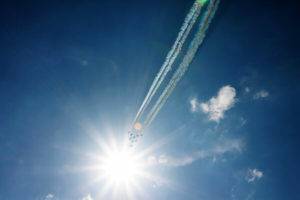 The Farnborough Air Show is one of the biggest aviation events in the world. 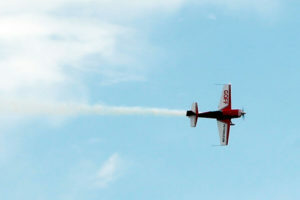 The dazzling event showcases both static and aerial displays. It is utilised by the International aerospace and defence industry to demonstrate civilian and military aircraft to potential customers and investors. The first four days of the show (Mon-Thu) are exclusive to trade but on Friday there is limited access to the public. At the weekend both days are open to the public. There are two ways to experience the excitement of the Farnborough Airshow. One is to buy tickets and spend your day inside the historic airfield, getting up close and personal to all the displays and entertainment. 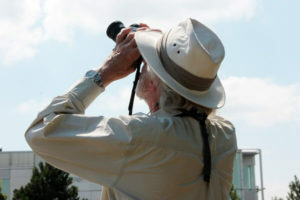 The other is to picnic in a nearby park in the afternoon or at various spots around Farnborough and just look to the skies. Farnborough has a wide range of pubs and restaurants available and is easy to get to from London. Having a day out watching incredible planes perform breathtaking manoeuvres is an easy, cheap and enjoyable experience. Tickets are available online at Farnborough Airshow. You can also buy tickets on the day but these are more expensive and if you are intending to visit on FAB Friday, they may have sold out. To guarantee your entry and save money, it is best to pre-book your tickets. Friday at Farnborough Airshow is known as FAB Friday. There are a limited number of public tickets available which allow full access to the complete trade show. An amazing opportunity and experience if you are an avid aviation enthusiast. At the weekends, the trade show still runs but in a reduced format. Children under 16 years are free of charge. This makes Farnborough Airshow a very popular family attraction. 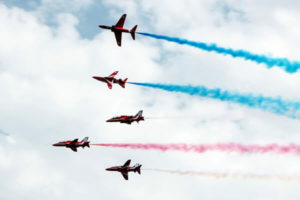 The easiest way to get to Farnborough International Airshow is by train. There are four stations that will allow you access to the airshow. Farnborough Main, Farnborough North, North Camp and Aldershot. 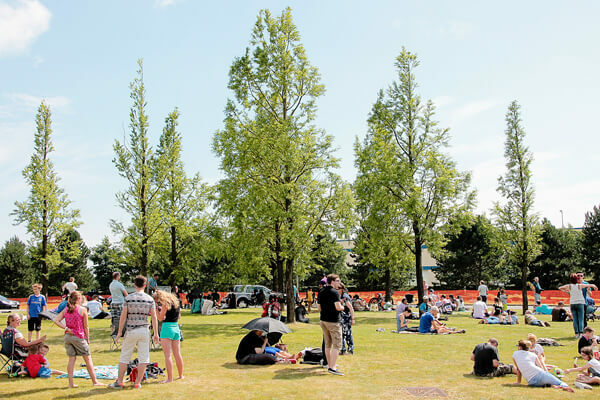 A free shuttle bus service runs from Farnborough Main, Aldershot and North Camp stations to the show site. Farnborough Main is served by Waterloo and is around a 30-min walk from the Farnborough Airshow Pedestrian Entrance (Gate B). 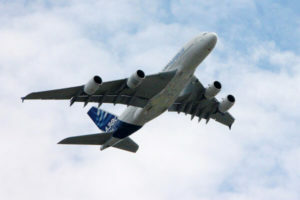 Farnborough Airshow is located on the A325, accessible from the M3 and A31. During the show, there will be special routes in the immediate vicinity of Farnborough which will be clearly signposted. Follow signs to the general car park. Parking is free and the general car parks are serviced by free shuttle buses into the show. It is worth noting that traffic will become congested during show times as Farnborough is already a busy commuter town. Static and Flying Displays – static displays of famous and interesting aeroplanes and flying machines and of course the flying displays that Farnborough is famed for. Aerospace exhibitors – demonstrations from leading companies across the globe. Brooklands Museum – display celebrating the pioneers of aviation. Boscombe Down Aviation Collection – Famous aircraft up close and personal. FAST Museum – Farnborough flying heritage exhibition. Futures and Innovation Zone – an inspiring area for the younger generation, focussing on careers in the aerospace sector. Jaguars Art of Performance Tour – get inside the latest cars on a test course. Light Aircraft Association – Display of home-built planes and discover how you could learn to fly too. Museum of Army Flying – 100 years of army flying. Space Zone – interactive and fun exhibits, astronauts sharing experiences, demos, seminars. Winchester Science Centre – mobile planetarium, inspired science. Over the week there are 600 exhibitors and retailers attending. Each day there are 5 hours of flying displays. 150 aircraft will be part of the event. 80,000 people are expected to visit over the weekend. As the airport is such an integral part of Farnborough, it is easy to watch the planes from virtually any area of Farnborough. Nearly every local pub and hotel will host a BBQ or event to coincide with the weekend airshow and to capitalise on the influx of visitors. The ones nearest the runway prove most popular. The Swan Pub, literally on the end of the runway near the Aviator Hotel is always popular as you can get very close to the planes coming in to land after their displays. On the opposite side of the airport, Southwood Golf course and the newly refurbished Monkey Puzzle pub prove popular viewing spots too. Why visit Farnborough Airshow 2018? 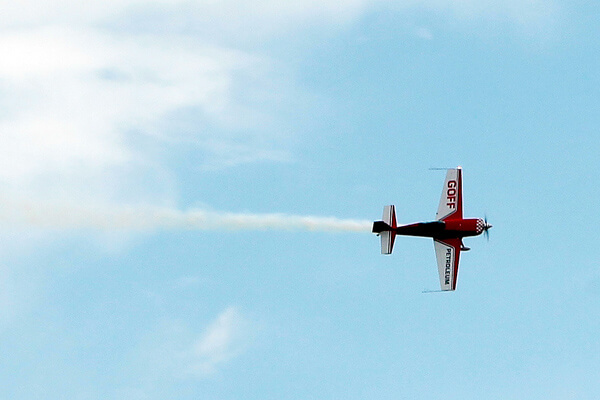 The Farnborough air show has something for everyone. If you love passenger jets, you’ll marvel at the manoeuvrability of these huge machines. Flying in ways you probably hope you’ll never experience in real life. 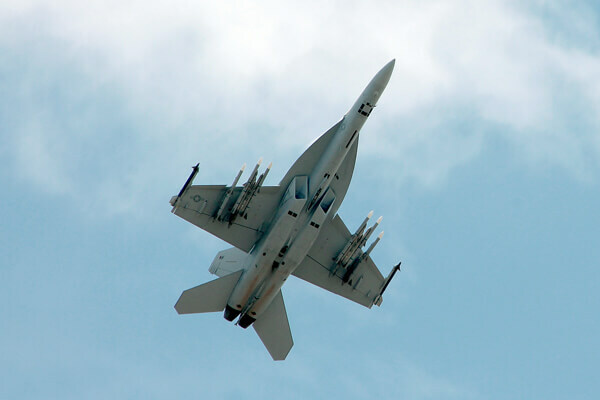 You may need to put your hands over your ears when the fighter jets take off, these incredible planes can literally take your breath away with the sheer noise and power on display. Red Bull Racing is joining in this year too which should be a spectacular event to witness. The Red Arrows are a staple of the weekend and worth the entrance alone. Farnborough is a historic aviation town that is rapidly building into a major commuter hub for London. The airport has expanded and now includes a state of the art conference centre rivalling some of the major London exhibition centres. Farnborough Airshow runs every two years and is a cornerstone of Farnborough’s heritage. A real bonus for families is that children under 16 get in free, which makes the cost of visiting as a family very good value. As you can enjoy the airshow with or without tickets, this biennial event has become a very popular attraction. Please do share your experience of Farnborough Airshow with us at London Toolkit in the comments section. We’d love to hear from you. If you’ve taken any pictures of the airshow just use the hashtag #londontoolkit in your social media feed for a chance to be featured.